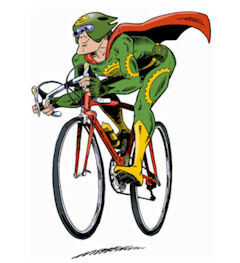 A super-hero has been created to speak - and sing - for all cyclists. He's called Sprocketman, and he's the hero of Critical Mass, which may be the worlds' first online cycling advocacy music video. OVCATA's Ish Theilheimer and friends from Stone Fence Theatre have launched the video as part of a crowdfunding campaign to raise money so we can make a full-length musical comedy that I wrote about Sprocketman and put it online. The video was recorded last spring in Petawawa, with numerous OVCATA and community volunteers. The crowdfunding campaign, on the website Indiegogo, went live on May 2. It can be seen at http://igg.me/at/Sprocketman. The show is a spoof of Superman, featuring the super-hero Sprocketman, his alter-ego, the mild-mannered reporter Mark Rent, and a cast of characters familiar to anyone who has ever loved Superman. Sprocketman has a mission to promote cycling and protect cyclists. When cyclists are in trouble, he appears, using his super power to magically fly in on his bike. So please visit the site and check out the song. It's at http://igg.me/at/Sprocketman.